The following are instruction manuals for the PlayStation 3 and Xbox 360 game Sonic the Hedgehog. It all started in Soleanna, the beautiful city of water. 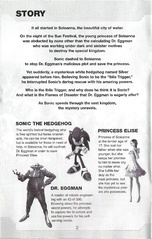 On the night of the Sun Festival, the young princess of Soleanna was abducted by none other than the calculating Dr. Eggman who was working under dark and sinister motives to destroy the special kingdom. Sonic dashes to Soleanna to stop Dr. Eggman's malicious plot and save the princess. Yet suddenly, a mysterious white hedgehog named Silver appeared before him. Believing Sonic to be the "Iblis Trigger," he interrupted Sonic's daring rescue with his amazing powers. Who is the Iblis Trigger, and why does he think it is Sonic? And what is the Flame of Disaster that Dr. Eggman is eagerly after? As Sonic speeds through the vast kingdom, the mystery unravels. This page was last edited on 28 July 2018, at 19:06.